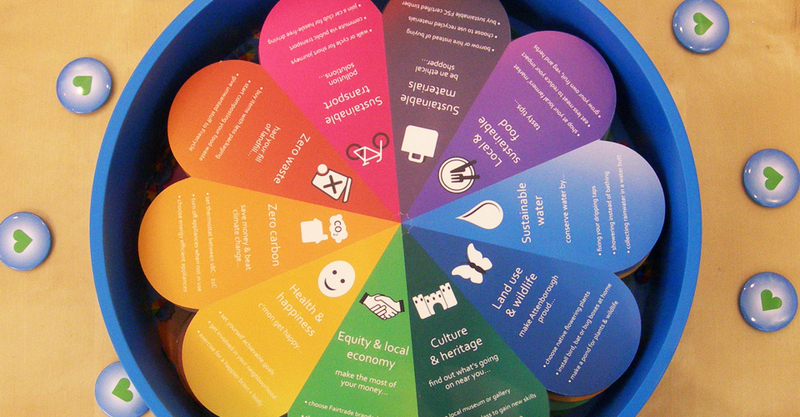 Address key themes: Interconnectivity, networks, resources, carbon footprints, play, engagement, communication, positive action, empowerment, working together, lifestyles, aspirational, being part of the whole. Find various methods of engagement for the Start Garden Party that take advantage of different levels and time scales of interaction. Use sustainable materials that can either be reused, recycled, or composted. 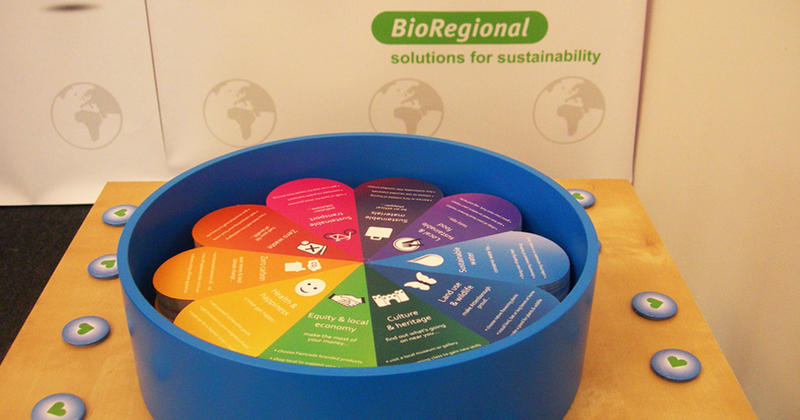 The unpredictable number of visitors to the event, which could result in a surplus of materials at the end, means that there needs to be a flexible solution which can be reused by Bioregional at other events in the future. 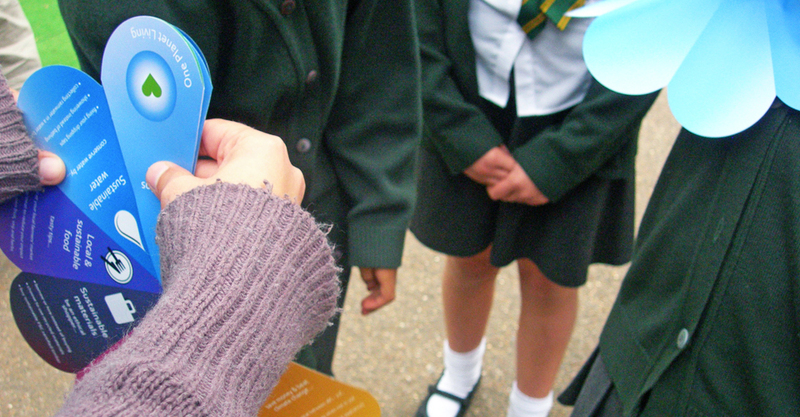 The Pin Badge – 30 second interaction – A pin badge with the One Planet Logo that can be handed out to festival goers, creating moving symbols of OPL around the Garden Party. 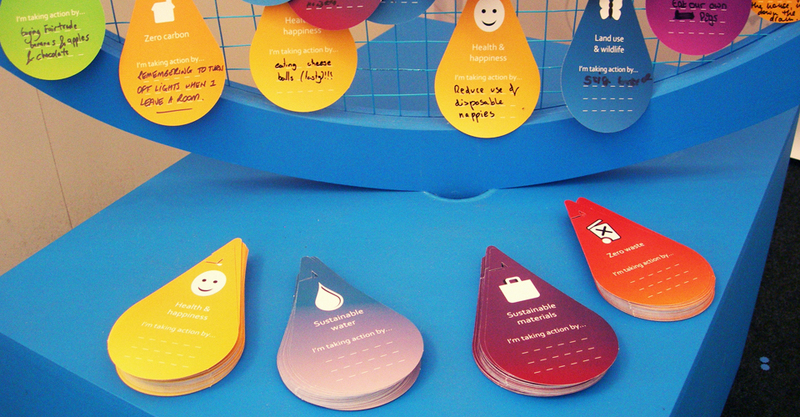 The Interactive Flyer – 1-2 minute interaction – A flyer handout which encourages festival goers to interact with the Bioregional Stand, giving Bioregional volunteers a chance to talk to people about the One Planet Living principles and giving people a small informative gift to take away. The Sculpture – 5-10 minute interaction – an installation representing the single planet of One Planet Living. 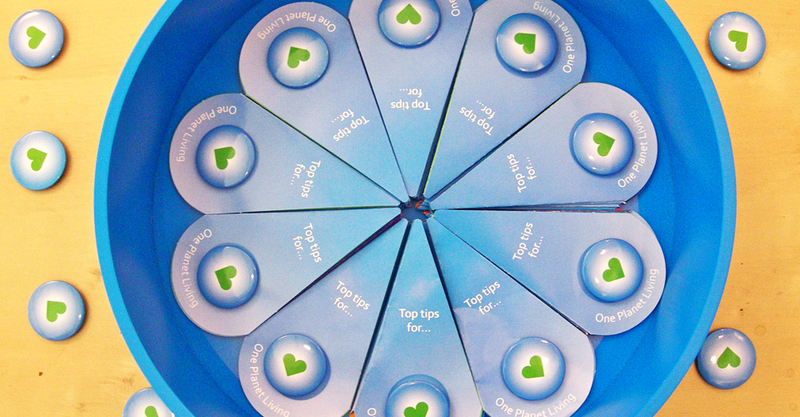 People were invited to choose one of the 10 principle petal flyers which they they are currently enact most often in their everyday lives, and write down what they are best at, thereby getting them to think about which areas they need to work on/hadn’t realised were important. 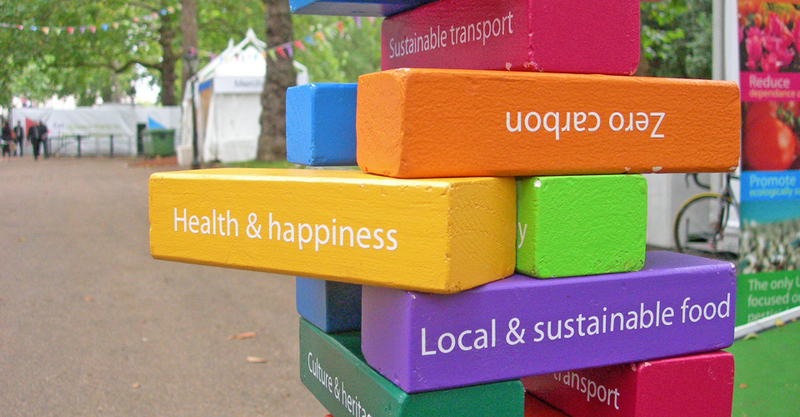 The multicoloured petal flyers built up slowly on the front of the sculpture over the two weeks – representing the multitude of elements that make up a sustainable planet. 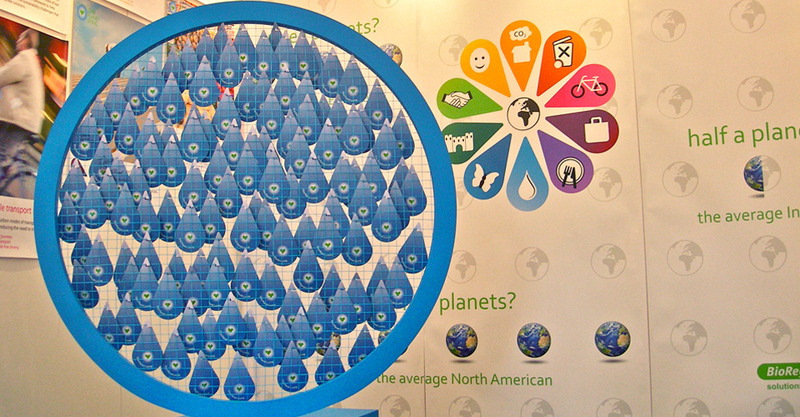 The back of the flyers, and therefore sculpture, was all blue to represent one planet. 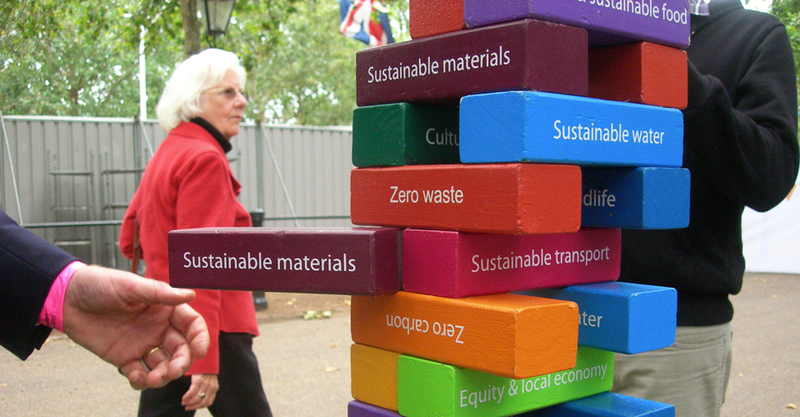 The Giant Jenga Game – 10-30 minute interaction – The fully customised OPL Giant Jenga set is an engagement tool that can be used multiple times by Bioregional: at the office in workshops, on open days and at subsequent events. It’s a game that all ages can enjoy and understand the basic principle of. The delicately balanced whole structure of the Jenga tower, made up of many elements, works well as an analogy for our delicately balanced eco-system made up of the natural resources that we consume. 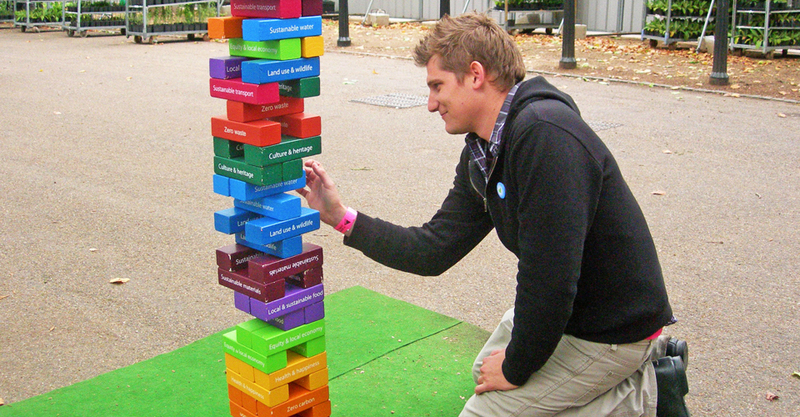 The Giant Jenga game demonstrates how only so many elements can be removed from the ‘whole’ before the ‘structure’ or ‘system’ collapses. 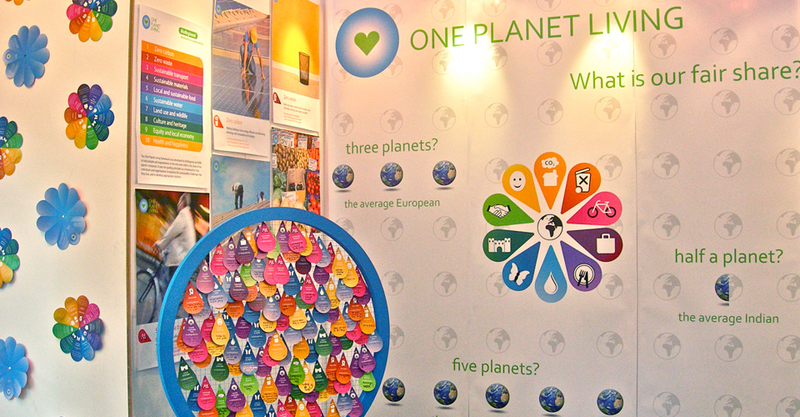 The Bespoke Wallpaper + Posters – in addition to the interactive elements of the exhibition stand we also created bespoke wallpaper which illustrated how many planets worth of resources people on different continents use. We also used photographic posters to illustrate the 10 OPL principles.